Children aged up to three are not charged for entry but will need a valid ticket. Children aged four to fifteen will need a valid ticket and also must be accompanied by an adult aged sixteen or over. 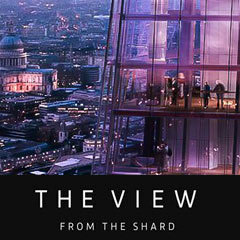 THE VIEW is open in Summer (Apr-Sep) from 09:00 am to 22:00 pm daily (the last timed entry is at 20:30, and no visitors will be permitted to enter after 21:00) and enables guests to experience the very different cityscapes of day and night. All tickets are dated, and timed with entry every 30 minutes. During Winter (Oct-Mar) THE VIEW is open from 10:00 am to 19:00 pm Sun-Wed, and 22:00 pm Thu-Sat (the last timed entry is at 90 minutes prior to closing time, and no visitors will be permitted to enter within an hour prior to closing time). Upon arrival with your booking confirmation, customers are to visit the admissions desk to exchange your ticket/voucher for a souvenir ticket from THE VIEW. This should only take a few minutes, and must be completed before entry to THE VIEW. Please note that entry is subject to availability slots. Some queuing time should be expected.